Hello, friends! 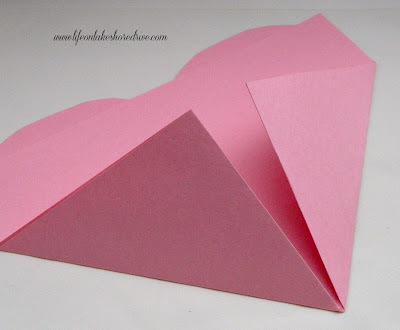 Today I am going old school and sharing the paper Valentine's heart holder that I make in my classroom every year. These are a fun alternative to the decorated shoe box. The students love it, because they've never seen these before. They have so much fun decorating them. 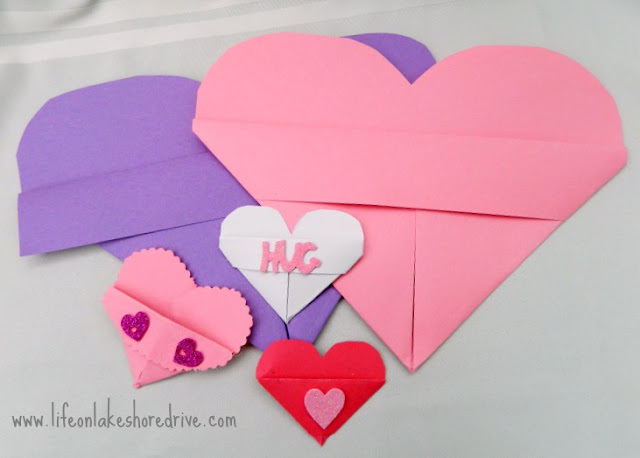 The list is endless in the way these paper hearts can be used. Usually, I let my students decorate them with paper hearts they've cut out, and I write their name on the front. 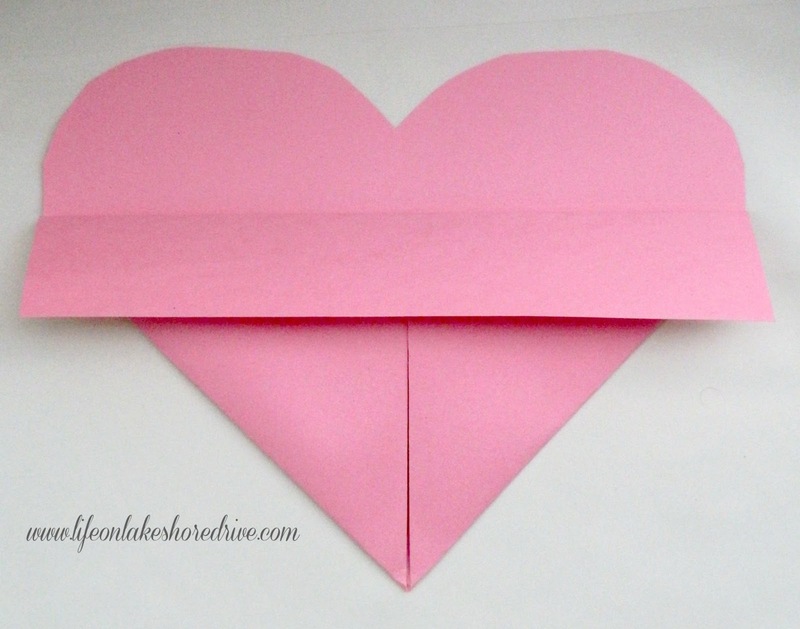 It's amazing just how many Valentine cards and candy these hearts will hold. They are so easy to make. 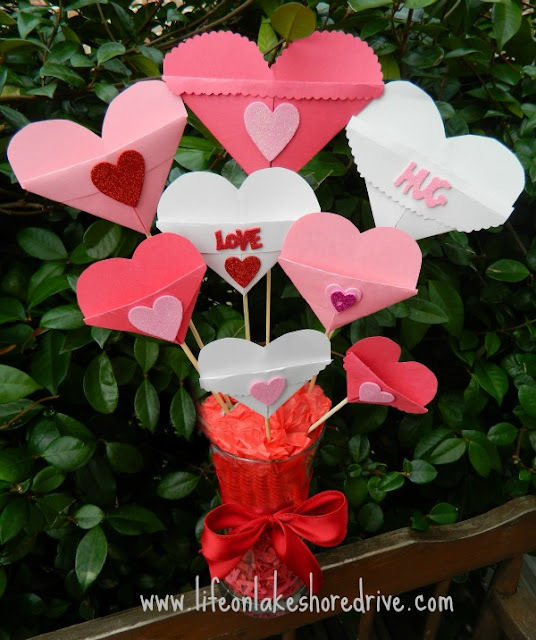 This year I got creative and made a bouquet of hearts to fill with candy and notes. 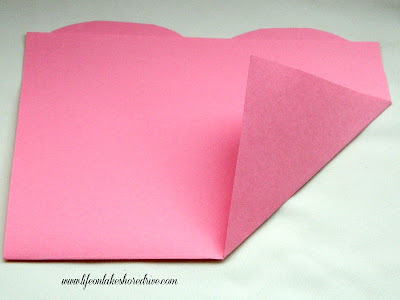 To make it easy to center the heart at the top, I fold the construction paper in half, and make a very small crease in the corner. Lightly draw a line in the crease, and draw the heart shape that you want to cut out. 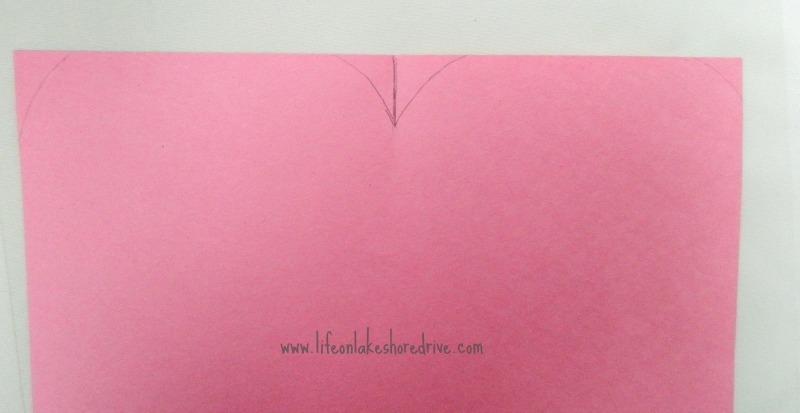 Cut out the heart shape at the top of the paper. 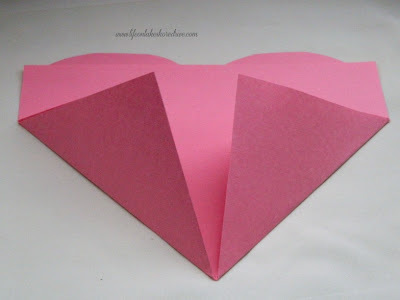 Next, fold the bottom of the construction paper almost in half. A very small part of the heart should be showing. Next, you want to fold both of the edges to the center. Once again, to make sure I have it centered correctly, I always make another small crease at the bottom center. 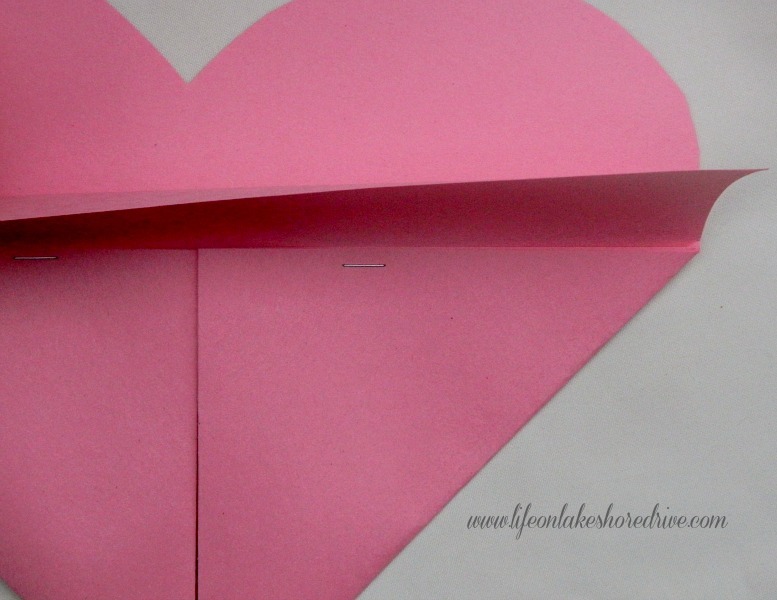 Fold the corner of the heart to the center, and repeat on the other side. It should look like the photo below. Once both sides are folded to the center, either staple or glue the pieces down. A stapler is so much faster and easier. The staples will be covered by the folded piece of paper. The last step is to fold the small remaining piece of paper down. This piece can also be stapled if you are going to be decorating over it. 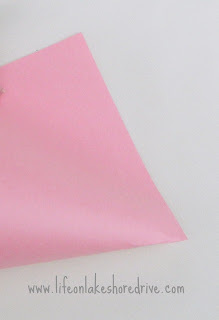 You can leave the fold pointed on the ends, fold and tape to the back, or use craft scissors to trim it. 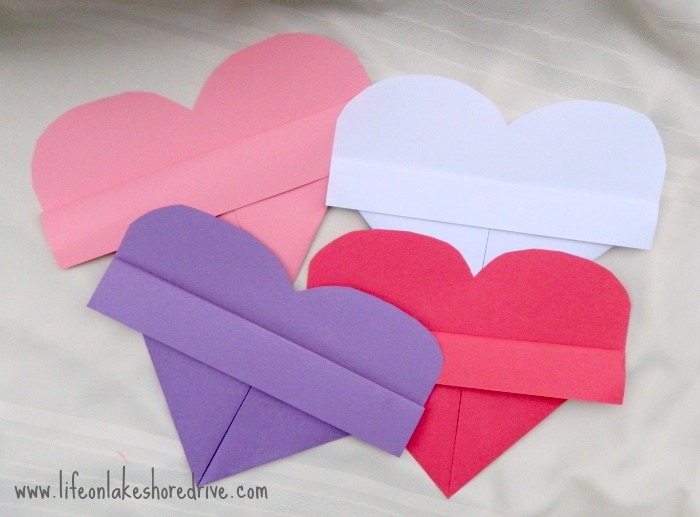 I made the smaller hearts the exact same way, except you have to adjust the length of the paper. Cut the desired size you want to make, and follow the same steps. Now it's time for the fun part of the project. Time to decorate. At school, my students cut out construction paper hearts and glue them on the hearts. You can use stickers, appliques, yarn, etc. Here is a heart attached to a skewer and stuck in a covered coffee can. I have used these at parties to hold plastic utensils and napkins. Leave the plastic lid on the coffee can, and stick the skewer through the lid to hold it in place. 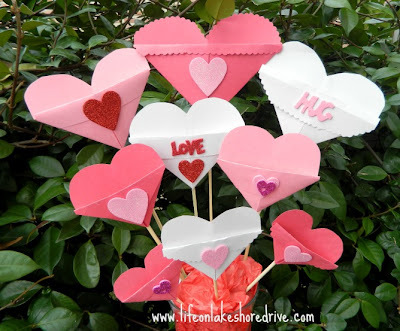 These are just a few ideas, but there are so many ways to get creative with these easy to make hearts. Thank you so much for stopping by for a visit. I so appreciate it. Have a wonderful week, friends! This is such an adorable idea! My daughter would love to make one of these! Thanks for sharing Kathie! Very cute and super beautiful!! 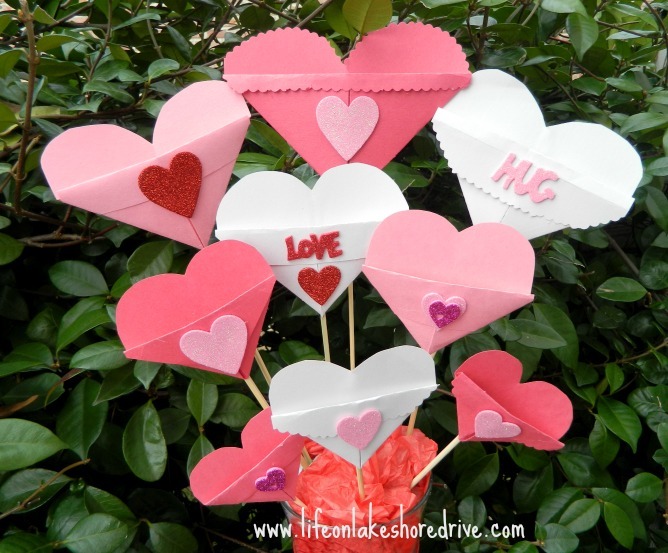 We don't celebrate Valentine's Day and but we do have a similar holiday in a few months - and I'd loooooove to make these with my nieces. Great idea! Sharing this with my homeschool buddies! These are so pretty! I love the origami effect even though they are simple to make. Yes, they do look "old school" and at first I thought these were what I made in elementary grades. Actually ours were decorated paper bags or tissue boxes! I love posts that bring back memories like this! Happy Valentine's Day, Kathy! So cute!Love this sweet and easy project! Wow...memories, of my own school days, so long ago! Thanks for sharing something for me to pass on to my grands! 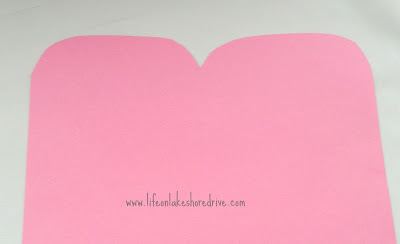 I love these paper heart holders :) Valentine's Day is so much fun to celebrate. Thanks for stopping by this weekend and linking up with my NO RULES party! How cute Kathy! I couldn't help but think of the airplanes the boys in class would make and throw them at me! lol I love how you can put things in these and how creative you can be with this. You are too much! I wish my daughter was still young, I know she would love making these. Of course, yours look very pretty in the vase and I could use that in my house! Thank you for linking up to the In and Out of the Kitchen link party! I can’t wait to see what you bring next week! 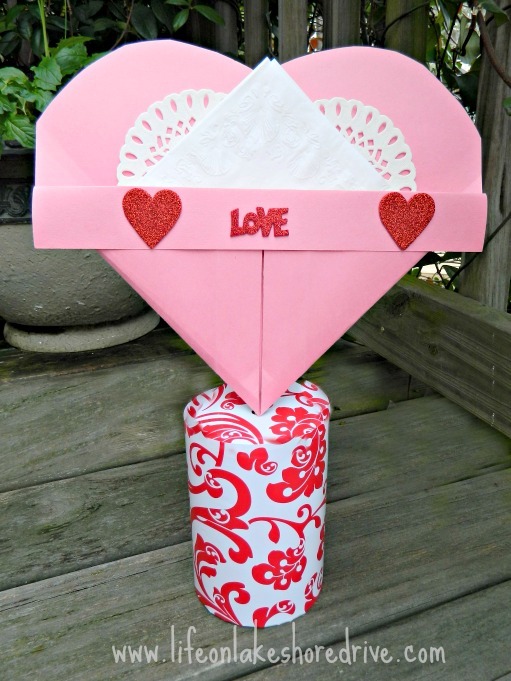 Cute Valentines craft! Thanks for sharing @ Submarine Sunday! Very Cute Kathy... I bet your student love having a teacher that is so creative! Thanks for sharing and linking up. Kathy, you are so creative! Thank you for linking up. What a cute idea. sent by Little Mom on the Prairie! 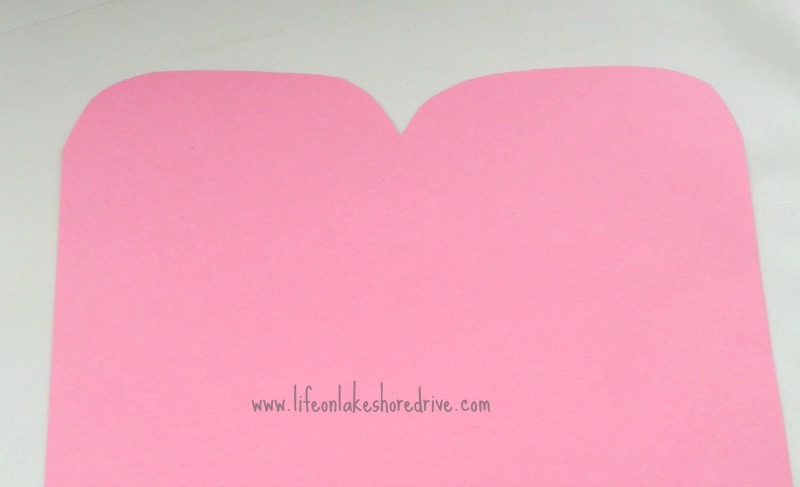 You've been featured at Little Mom on the Prairie! So cute Kathy! My friend gave me a darling one with candy bars and such a few years ago. It was too cute to eat so I put it out every year for decor. Thanks for sharing with SYC. What a cute arrangement! Hope you had a wonderful Valentine's Day! Thanks for sharing with us at the Monday Funday link party! Kathy. this is such a sweet post. Thanks for sharing at Fluster's Creative Muster. Looking forward to seeing what you link up next week. Oh WOW Kathy!!!! That's so cute!!!! I'm going to have to make some!